Let the season of sock-knitting for grandma begin! No, she hasn’t officially asked for a pair, and no, she’s not expecting to receive these. But the air is crisp, the leaves are turning, and I declare the season open. Pattern: Merino Lace Socks by Anne Woodbury from the Favorite Socks collection; originally published in the Summer 2003 issue of Interweave Knits. Yarn: Fleece Artist merino sock yarn, ivory colorway, 1 skein. Purchased from Tidal Brook Yarns. I hope my interpretation of the pattern makes the socks more appealing than their photo in the book ;). It’s a lovely pattern – pretty and easy to memorize, with the potential to shine even through lightly-variegated yarn. At the end, despite the pre-treating and soaking and scrubbing and spraying… the Gatorade-induced stains did not come out. They’re quite visible on the first sock (on the right in the photo above), but the little orange bits knit into the second sock don’t stand out. In any case, I’m not fretting because I know my grandma won’t care ;). The yarn knits up wonderfully, and I’m happy to have worked with it for a second time. Do I favor it over Lorna’s Laces? Mmm, probably not. Currently a certain poppy-colored sock is clouding my mind when it comes to all things LL ;). Those are very pretty socks! Grandma’s are wonderful because they don’t care if there are little things that others would consider bad! 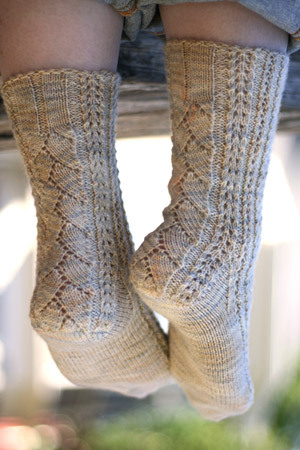 They look fantastic Kathy – the light yarn really shows off the delicate patterning. The Gatorade adds to the overall effect I think. Has anyone tried dying yarn with Gatorade? If Coolaid works, why not? I have not felt like knitting socks for a long time, but this pair of socks is just so beautiful that I will go and take out the book and the needles and yarn. Your colourway is lovely and the pictures great! Thank you for the inspiration. They’re absolutely exquisite! The colours of the yarn are so delicate but work so perfectly with the pattern, it really couldn’t be better! Oh and the stain is barely noticeable at all (well in the photos at least). the socks look great! and i *love* that first pic — the swirly trunk, the rolled up jeans, the leisurely weekend feel. Love the photo shoot you did with those lovely socks. Grandma will love them! Knit pattern books should come with a bound-in pocket for correction pages! Nine corrections to this book alone. Can we agitate for such a pocket? 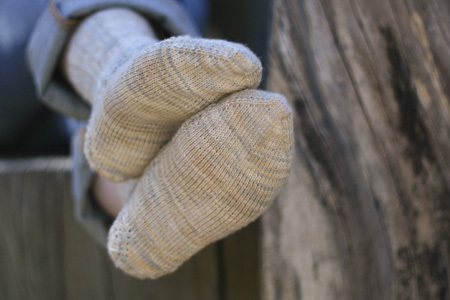 Lovely socks – look so much better than those in the book where the colour does absolutely nothing for the pattern. They are on my list to kniw before Christmas. maybe they can reshoot the Favorite Socks book using YOUR PICTURES! I only ever want to knit socks from this book when I see the ones you’ve completed; otherwise, blah…the socks just lying there empty. You literally give them life. Thanks for sharing. maybe they can reshoot the Knitting Vintage Socks book using YOUR PICTURES! I only ever want to knit socks from that book when I see the ones you’ve completed; otherwise, blah…the socks just lying there empty. You literally give them life and the Favorite Socks, well, new life. Thanks for sharing. So beautiful! I didn’t even give this pattern a second look in the book, so much more gorgeous in this lighter shade of yarn! So pretty…the yarn really does show off the pattern nicely! Your pictures are great. They show off the pattern much better than the picture chosen for the book. Your knitting isn’t bad either! I bet your grandma is going to love these socks. Wonderful photography! The socks ain’t bad either…..
It’s socks like those that make me think I should declare an end to my sock moratorium. Wait, two deep breaths, no, I’m good. I shall continue to admire from afar. Lucky Grandmother! Have you tried a little vinegar to get the Gatorade out? I find for hard-to-remove stains, distilled white vinegar usually does the trick (it even removes red dye from white garments). Beautiful socks! I’m sure Grandma will love them! Woo! Your socks and photos really show off some details that I didn’t see in the book. I must knit these now and I have a good yarn that’s been waiting for a good pattern. Thanks! The socks look lovely. I hardly noticed the Gatorade stains (in fact, I forgot they were on this pair). Your photos (expecially the one showing the heel/back side) are far more indicative of the pattern than the book’s photo. I will eventually have to be a copycat and knit those socks because they are gorgeous. I like the way the lace goes down the back of the leg and heel. Nice! They are so pretty. I’m sure I passed by those socks every time I’ve looked through the book never realizing how pretty they could be! You’re pictures are so much better than theirs. I’m sure your grandma will love them, even with a little of color from Gatorade! Your photos make me want to knit that pattern whereas the photos in the book were kind of eh. Lovely yarn and pattern combination. I’m going to have to try some Fleece Artist one of these days. You have just kickstarted the return of my sock-knitting-mojo. Have you tried the cocktail of spray n wash with resolve and then oxyclean and hot water? My MIL Swears by an ammonia mixture to get things out of fabrics. I will have to ask her for the recipe. Socks look great, as usual! I love the way you set your site up! THose socks are gorgeous. I knit them last year out of the Interweave magazine! I love the way they fit……and the gatorade stains, can you get away with calling them hand dyed 🙂 ? OK. I need to know. I have the first edition of this book and I had downloded the corrections, I can’t find the mistake in this graph. Where is it? I was ready to start this before you posted the photo’s and now I am stalled until I figure this out. What great socks! I had no idea from the pictures in the book. Those socks are gorgeous I am sure your grandma will love them. I am looking forward to seeing the Poppy socks, its a great colour. Dear Grump. I am really thinking of buying this book, but need to know if it has patterns for men. I like to knit for my Hubby, and he will wear my socks, a very basic pattern and know I need to move on. But before I buy this book I need to know if there are men’sm patterns. Thank You, and I truly love your blog, read it all the time. I am also going to make him a scarf, mofdeled after your Dad’sn of course!